Gardens and parks are a constant source of inspiration, forever changing with the seasons and creating different shapes, textures and colours. Concentrating on interpreting the garden in the summer season, over the next three months I will give you advice and tips on how to approach what sometimes can appear to be quite a complex subject. In this and my follow-up articles in the September and October issues, I have limited my palette to six colours; a warm and cool shade of each primary colour. If you would like to try the colour-mixing exercises and you do not have the colours I used, just substitute them for the nearest shade in your palette. 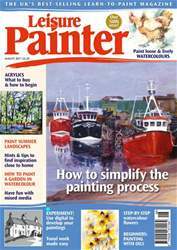 Welcome to a summer of drawing and painting with Leisure Painter. This month we tackle summer landscapes, gardens and flowers, buildings, harbours and boats, animals, local scenes, a moonlit seascape, horses and a flamenco dancer in a variety of your favourite media. If you're ready to try something different, experiment with oil pastel resists with acrylic inks and watercolour, look at coloured grounds for mixed-media work and embrace digital with an app that will help you draw and paint better pictures! From loose and lively to detail, monotone to colour work, and projects from photographs to how to paint from life - enjoy another month of practical tutorials, demonstrations and inspiration.